-4- of people you have traveled from Iowa City with up to the meeting. There are several [pintos?] (prisoners) standing around in the corridor outside one of the classrooms on the second floor. They look at you momentarily expressionless and then smile. Inside the meeting room there are several more pintos, about seven or eight in total. They are American Indian (Mesquakies from Tama) and Chicano (from Texas). People mingle about holding one conversation momentarily and then another, eyeing the table at the back of the room that is loaded with potato chips, doritos, pretzels, and an ice-filled tub with soft drinks. A tall man walks to the front of the room. He is massive-built above the waist. A rippling upper torse, thick muscular thighs, in faded denim jeans and shirt. He looks out over the crowd now seated, waiting for silence. The monthly speech by Preston M. Duncan of the American Indian/Chicano Cultural Center Begins: "Aho! Cousins, Brothers and sisters. This is a very good day. I am hoping you have had an interesting journey here and [wish?] you all an interesting and happy journey--and above all--a very safe journey back to your destinations. We, of the Center are grateful and appreciate your interest and show of support by being with us today. We are aware that because of the strict enforcement of our limitation of guests there would be more of us today from the free world. We of the Center depend upon you for our strength, and again in grateful appreciation not only from us, but from the rest of the general convict population, we sincerely thank you for your support and interest in our welfare." The big, strong features of this man from the Tama Settlement in Iowa belie the gentle graceful manner as he speaks. Preston was brought up by his grandparents, whose beliefs were deeply rooted in the Sac and Fox mysticism of the Old Ways. He is an artist, "from the woods," as he says, and the long solitary periods he spent there are obvious in the exquisite, finely-detailed ink drawings he has made. Delicate, serene studies [of?] wood creatures--far from the lethargic [? ]urosis of caged zoo animals--serene in their own surroundings. As he stands at the front of the room, sometimes hesitating yet never diffident, I think that the gentle, quiet-spoken artist is truly free. You can see it here. AMERICAN INDIAN/CHICANO CULTURAL CENTER The American Indian/Chicano Cultural Center's emblem is unique in its own respect, that it shows a unity of the Native and Chicano peoples like never before. In the center of the emblem an eagle, no ordinary eagle but the La Raza Eagle for Chicano unity. The La Raza Eagle is placed upon a shield, no ordinary shield but the plains warrior's shield with five sacred eagle feathers. In the background surrounding the shield the Spirit of the Buffalo, meaning the return of the Buffalo to this land and to the people. The cultural Center is a member of the American Indian Movement. The Center's address is Box 316, Fort Madison, Iowa 52627, inside the Iowa State Penitentiary, beside the Mississippi River in the southeast corner of Iowa. Ways to help the American Indian/Chicano Cultural Center--The people who know of the Cultural Center's activities are asked to keep the Center alive and strong by fulfilling some of these responsibilities: TAKE ACTION ON WHAT YOU KNOW OF THE CENTER Write letters, organize, think, learn, change, give support, improve life-style, lend spiritual help, form a community support group. 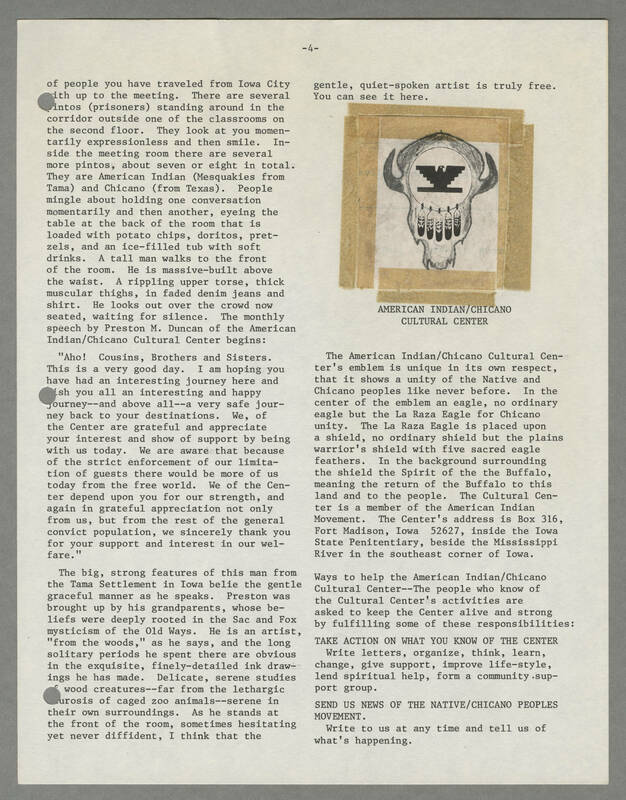 SEND US NEWS OF THE NATIVE/CHICANO PEOPLES MOVEMENT. Write to us at any time and tell us of what's happening.